Pick a day, any day. You’ll find me in the kitchen, testing recipes, shooting videos or cooking for a crowd. It’s my “home” inside my home. When preparing food for a hungry gathering, you can bet that I will include dishes that are tried and true; the dishes I know people love. Everyone who enjoys cooking is always looking for recipes that will make them instant rock stars in the kitchen, which brings me to one of my all-time favorites, my Momma’s best-ever homemade meatballs. That’s all I’m going to say. Just make them and see for yourself. In fact, make a big batch, freeze some for later or have a big bowl of Pasta with Meatballs tonight. 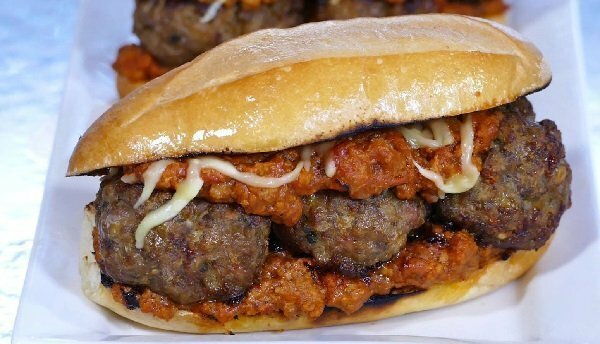 I’m including a link to Momma’s homemade meat sauce so all you have to do is pick up some nice hoagie rolls and you’ve got yourself a killer Meatball Sub! Or, maybe you’ll just opt for a good ol’ plate of pasta with Momma’s Meatballs. Either way, in honor of Mother’s Day and my own fabulous mom, here’s the best dang meatball recipe an appreciative daughter can share!